Now Courchevel doesn’t exactly have a reputation for purse-scrimping, but €63 million (£50 million) for a swimming pool seems somewhat excessive. 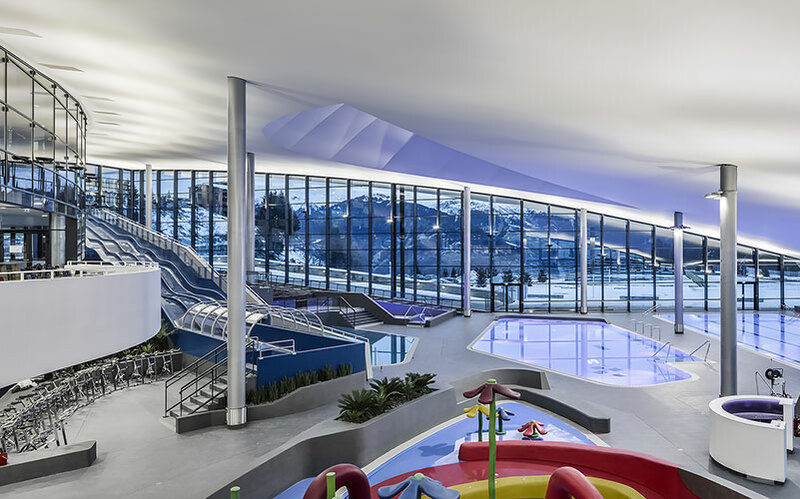 We head inside to discover what Courchevel’s Aquamotion is really like and whether it’s worth its incredible price tag. I visited Courchevel in mid-January, ready to explore the slopes of an area I’ve not skied all that often. Alas, it was not meant to be. As has happened a few times across the Alps this season, the weather had decided to make it’s power known, with snow and gale-force winds meaning that skiing was pretty much out of the question. Disappointing yes, but every storm cloud has a silver lining, which, for me, was Courchevel’s Aquamotion. Since hearing about this development a few years ago, I have been dying to see it for myself. However, like many die-hard snow sports fans, when I find myself in the mountains, I tend to spend as much time as humanly possible on the slopes, leaving myself very little time for leisure activities! So, I thought I’d take advantage of the awful weather and spend an afternoon here instead. I chose to visit Aquamotion on a day when there was very little skiing open, which meant that unsurprisingly, a lot of other people had had the same genius idea. As a result, it was pretty busy, with a lot of families taking advantage of the many entertaining children’s pools to keep their little ones entertained for the day. However, we did not have to worry about the crowds, as upstairs, Aquamotion has a special ‘adults only’ area. It’s pretty clever – you have to scan your wristband to gain access, which means no children sneaking in. This area is an absolute delight. Honestly, I could have stayed here all afternoon had I not wanted to explore a little more. There are so many different sections, it’s almost difficult to choose which kind of pampering you want first! We opted for the ‘salt water spa’ which was an amazing experience. Upon wading down some stairs into a salt water pool, you turn a corner into a dark, cavern-type area. Mesmerising kaleidoscopic patterns are projected onto the main wall, providing the only real source of light, while lovely relaxing music plays in the background. Floatation devices such as noodles are provided and you simply sit back and float, immersing yourself in the water and the experience. It may sound bizarre, but this ‘adults only’ section is almost like a meditation area, you feel so relaxed. It’s almost like you have to wake yourself from a stupor to drag yourself back out to the main area! The main area consists of a large pool, with two separate areas of massage jets (a long straight section along one side, and a semi-circle section on the other). The pool goes right through to the open air outside, with another area of massage jets here, surrounded by the snow. The utmost in relaxation. Surrounding the pool inside are loungers and seats, as well as a ‘juice bar’ if you’re really feeling healthy. You could honestly spend a few hours here. Along from the pool, you can find the sauna section. Again (this happened quite a lot at Aquamotion) it was unlike any sauna experience I’ve ever had. There were so many! From two levels of sauna, to a steam room and a cool room, you can take your pick of relaxation therapy, beside which, there’s an area with showers and ice buckets. If you have never experienced the sensation of an ice cold bucket of water after a relaxing steam, it’s definitely something you need to try at some point in your life! The main area at Aquamotion is also an absolute dream for children. With two huge waterslides, two diving boards and two children’s pools, there’s a great amount of entertainment for kids. That seemingly unrelentless energy will be well harnessed here, with enough interactive water activites and games to keep them amused for hours. It’s a great place to spend time as a family, whether it’s at the end of a great day’s skiing, or indeed a day in itself if conditions up on the mountain aren’t quite child-friendly. For older children and adults, there’s a more serious athletics swimming pool, as well as another that heads outdoors, so you can enjoy the experience of outdoor swimming in the mountains as a family. Here, there’s a rapids area, with bubble jets to propel you around so you don’t even have to exert yourself! So now I’ve stopped raving about how great and relaxing Aquamotion is, let me take you through what else they have on offer (I know – there’s more!). Throughout the season they run evening sessions within the pool, such as cycling. These look more like underwater parties than exercise and a whole lot of fun. Outside of the pool, the next main attraction is the surfing experience, where you can try your hand at bodyboarding, surfing or wakeboarding, all indoors…in a ski resort… Unfortunately I didn’t get to try this out myself, but from what I’ve gathered, it’s harder than it looks! For those that want some indoor activity but don’t fancy the water, there’s a gym, yoga, pilates, and even an 11m climbing wall, with an area for children as well as an area for adults. If you’re really feeling like a pamper, why not treat yourself to one of the many beauty treatments on offer in the luxurious spa and balnéo areas, which offer a wide choice of relaxing, anti-stress and detoxing treatments. From whirlpool baths, Vichy shower, essential oil domes, hydrojets, body jet showers, massages and body treatments, to cyrotherapy, there’s a huge choice on offer. If you’ve never visited Courchevel 1650, it pays to know that one of it’s crowning glories is the covered escalator that runs from the bottom of the town all the way to the main street at the top. This escalator is an absolute lifesaver if you are staying a little way down and don’t fancy trekking up around the roads in the midst of a blizzard! It’s at the bottom of this escalator that you will find Aquamotion, making it relatively easy to get to, no matter where in the resort you are staying. Once you reach the bottom you do have to walk for about 5-10 minutes down the hill, but this walk actually serves simply to get you more excited to get to Aquamotion, as you can see it below you, heated outdoor pools and all. 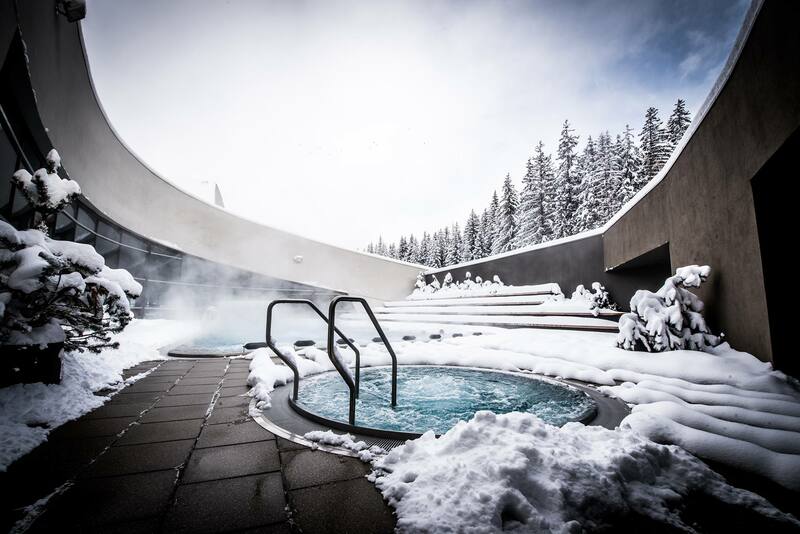 As you may expect from such an establishment in Courchevel, the prices aren’t cheap, with a day pass (including the adult wellness centre) at €37. While you certainly wouldn’t want to be coming here everyday, after experiencing Aquamotion, I’d say it’s most definitely worth the one off cost. Plus, there are often deals and discounts – for example, if you go as a couple, you can get a pass to the wellness centre for €66. So grab a pal and get saving! More good news for holidaymakers is that if you have a 6-day 3 Vallèes lift pass, this will give you access for one session at the Aquamotion so you don’t even have to fork out any extra cash! We stayed with Alpine Residences in the fantastic new Le C Apartments in the heart of Courchevel 1650.